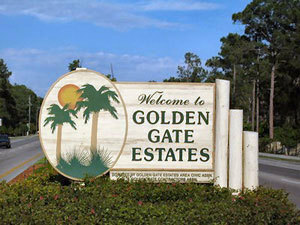 Golden Gate Estate is in the Eastern part of Collier County, Naples Florida. Residents love the area because of it Rural and natural setting, and that most homes are in large lots that are back from the street for privacy and the outdoor setting. Many resident love their animals, i.e. horses, dogs and Golden Gate Estate allows you to have your pets. Many of the properties allows horses, additional storage space and guest house. Residents also have plenty of recreational activities in the area and Equestrian facility and not to mention that Naples white sandy beaches are just a short drive west. Interested in finding homes for sale In Golden Gate Estate in Naples FL Click that link to find all the currently available homes in this area of Golden Gate Estate. The homes you would expect to find in the Golden Gate Estate area are generally going to range in size between 1000 - 5000 square feet on 1.14 to 5 acres tract of land. Right now we are seeing a lots of new home Construction in the area. The Golden gate Estate area is rural and most of the residential lots ranging in size of 1.14 acres to as much as 10 acres Plus. So as a buyer you have a lots of option on the size of the residential lot. There is plenty of room to build out a pool, have horses stable, RV, Extra Storage space, Guest house and have other animal in you backyard. If you enjoy the outdoors than this is the place to be, Golden Gate Estate. The eastern part of Collier as per Collier County management growth report is expected to growth by approximately 300 thousand by year 2040. So, if you are Looking for Privacy, space, the outdoor beauty in a natural setting. Than the Golden Gate Estate area of Naples FL is the place for you. Golden Gate Estate is going through a lots of changes. We are seeing the area growing in size. There are new home Construction, new Public Supermarket on Randall and Immokalee Road. A new CVS in the near future and an approved 50 Million Park in Golden Gate Estate. The park will be built on a 150 acres tract next to the Collier County Fairground off Oil-well Road and Immokalee Road. A new Charter Academy is being build just of Wilson and immokalee with a completion date of August 2017. Ave Maria Community In Golden Gate Estate This is a planned Community with Over 31 floor plans from 3 builders with prices ranging from the high $100s to $400s. See link for all available homes in the area. You will find a great restaurant Gino's Tratoria per Tutti, and a great neighborhood Irish pub. A new Rural Land West community is in the near future. Here are the surrounding communities: Waterways , Valencia Lakes , Valencia Lakes Country Club and Orange Blossom Community . This area has exploded in growth for over the last several years.